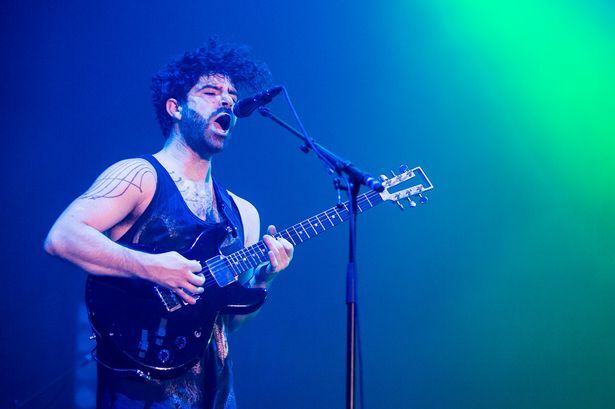 “Leeds, you’re f------ awesome,” announces Yannis Philippakis, he of the bear-man beard and floral-shirted fame, as he appears out of the dark again to rapturous cheers for an encore. “Seriously, you guys are mint.” There’s an uncharacteristic smile pulling at his lips and the Greek-born, Oxford-raised frontman seems genuinely warmed by the ecstatic reception that has greeted his band on the final night of their maiden UK arena tour. Yannis Philippakis of Foals, live in 2016. Courtesy of Birmingham Mail. Foals have just made the step up this winter, on the back of last year’s fourth album What Went Down, a defiantly forward-facing record that the elements of the previous three, throws them in a blender and sets the dial to heavy. Eight thousand people are packed into the First Direct Arena tonight to see the quintet ascend to major player status on the British music scene and there’s a feeling of triumph in the air before even a note is struck. From the off, they aim to impress. Entering to Sabbath-styled chords that hang ominously in the venue, they charge into the motoring Snake Oil, a song that builds upon its motoring krautrock rhythm and transforms into a sleazy stoner-noise jam. It’s a statement of fierce intent, and even if the sound system takes a few minutes to right itself, there is no stopping the blunt trauma it evokes in its crunching lines. They don’t let up either; the Talking Heads-esque My Number follows shortly, a song that bounces on record, but packs a beefier punch live. 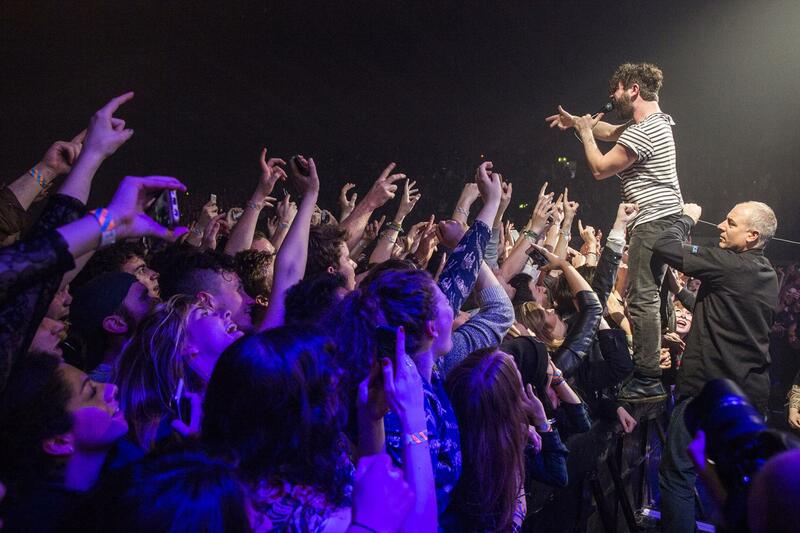 Foals live at Wembley Arena in 2016. Courtesy of DIY Magazine. Four albums in, the band have shifted from their math-rock origins into a heavier beast and it shows throughout. 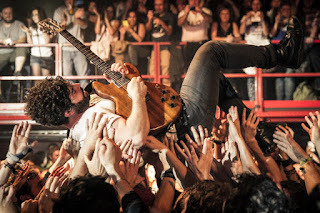 Older tracks such as Olympic Airwaves and Balloons, both from debut Antidotes, are both somewhat jittery songs, but Philippakis, along with bassist Walter Gervers and drummer Jack Bevan, have smoothed out the agitated rhythmic angles, transforming them into muscular, groove-laden arena rock renditions that feel right at home in cavernous surroundings, an easier listen for fans as they flow stylistically with newer material. New material that is definitely calibrated for such venues. Birch Tree crosses oriental soundscapes with the arena-friendly style of the Red Hot Chili Peppers. Give It All is a lighters-in-the-air moment, underscored by muted bass-heavy rumbles that build to a desperate yelping plea from Philippakis. Mountain at My Gates is their finest pop song yet, an anthemic rush that evokes all sorts of emotions Only A Knife in the Ocean falls flat, its back-and-forth tension release failing to translate from record. 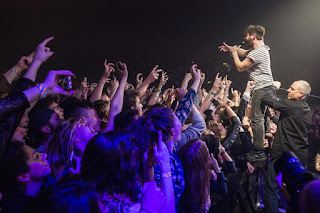 But even then, it’s all distinctly Foals; instead of pandering to arena-rock convention, they have created something that does not sacrifice any of the nonconformity that made them stand out initially in 2007. It’s unashamedly pleasing to see and hear, thrillingly exciting as it unfolds. But Foals didn’t reach arenas on the back of just one album and Antidotes and Holy Fire are well represented. Red Socks Pugie bears a tighter rhythm that explodes in its outro, all rave-house synths and growling guitar. Late Night sighs in a resigned desolation as it builds on a driving foundation. But it’s post-rock classic Spanish Sahara that truly shines, its evocative lyrics and sparse instrumentation slowly building to an exhilarating crescendo under a bank of sparkling lasers. The stage show is arena-cliché but undeniably effective, with strobe bars tinted a hellish red during a snarling Providence creating an unsettling weight that darkly lingers throughout. Yannis Philippakis crowdsurfs in Luxembourg in 2015. Courtesy of Three Songs. Philippakis, once cripplingly stage-shy, is arguably one of the best frontman in the business, whipping the crowd into a frenzy with his tortured screams during set closer Inhaler. For the encore, he sings candidly on London Thunder about loneliness, around the chiming electric piano of keyboardist Edwin Congreave and Jimmy Smith’s mournful guitar lines, before he stage-dives during the surging What Went Down as droning organ and brutal riffs collide. They close proceedings with an extended, feedback-drenched rush through Two Steps, Twice, a kinetic, frenetic finale that lingers long after they’ve left the stage. They now move onto the gargantuan task of headlining the world’s greatest rock festival in Reading and Leeds in six months’ time; based on this, they needn’t worry. They’ve made arena rock much more interesting; chances are they can do the same in Bramham Park.